Adjustable Spindles - Adjustable Multi-Spindle Heads are suitable for equally spaced hole patterns only. Click HERE for how they are adjusted. They are best suited for low volume work where the requirements change from time to time. These units are stock items. They may be adapted to almost any machine. 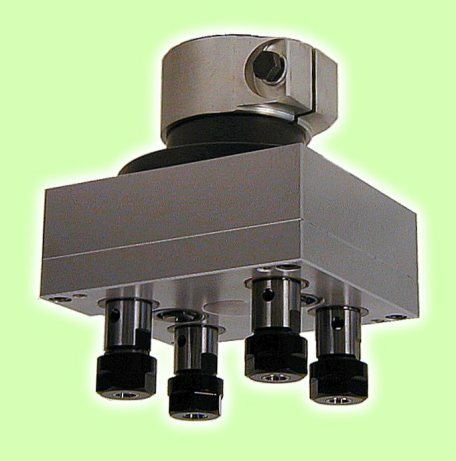 Jump to our Selection of Adjustable Multiple Spindle Heads for more information. All the spindles operate in the same rotation that is also reversible. Drilling, reaming, tapping and light milling are suitable operations. Fixed Pattern Multiple Spindle Heads are for any irregular hole pattern. They are custom machined with short lead times. An addition advantage is their compact size weight and height compared to similar adjustable heads. Click HERE to view an example. Our Application Sheet may be used to send information to us about your application. Offset Spindle (Fixed Pattern) Heads - Problem hole locations, as near an obstruction, may be drilled with our Offset Spindle Heads. The output spindle or spindles are not in the same line as the input of the head. This can move the drive mechanism enough away from the obstruction to solve your problem.